Whether you are looking to sell your house immediately or just boost its value in order to remortgage onto a better rate, there are a few things you can do to it on a budget to give your house a face-lift and increase its value. Decorating and renovating don’t always have to break the bank, but the more you put in, the more you are likely to get out, so if you do have some money to invest, your home should be your first port of call. An increasing number of homeowners are finding it difficult to remortgage elsewhere or reduce their mortgage because their house has dropped in value, so are looking for ways to increase its value. Ok, so it might not be something you can do overnight, but if you seriously want to boost the price of your property, a loft conversion will add between 6 and 10% to your property’s value. You will obviously need a loft in the first instance and it may be some time before you are able to recoup any gains from your investment, but in the long run you will see a positive return on your money. Most people will be amazed at how easily they can fit a second toilet into their house without having to build an extension or start knocking down walls. 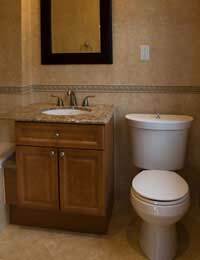 A downstairs toilet can add around 5% of the property’s value to your home. If you have a large cupboard or a chunk or another room you can convert, this could be an easy way to add an extra toilet. Just because you don’t have a garage it doesn’t mean you can’t create some off-road parking, or even on-road parking. If there is no way to extend your drive to incorporate a parking space, you might want to ask your local council for planning permission to lower the curb on the pavement outside of your property. This will normally cost between £1-3,000, but will incorporate the space into your property and make it more attractive. You may not think it, but not everyone will love your choice of decor. When it comes to selling a house, it’s best to put the brightly coloured paint away and stick to cream and white colours if you want your house to be appealing. Although it is hard to pinpoint how much value decorating adds to your house, it does make it more attractive to potential buyers and it could mean the difference between a sale and no sale. Not all changes that add value to your house have to be cosmetic. On average eco-friendly homes are worth 6% more than standard ones. Installing good loft insulation and wall insulation could reduce your bills by £210-£250 a year. Although you will initially need to pay to get it done, it will ultimately lead to your home being more affordable. The thought of digging up weeds might strike fear into you, but having a tidy garden can add thousands of pounds to your property.Keeping your garden well maintained and attractive will not only make your house look prettier but it will also attract potential buyers. And once you have the gardening bug, why stop there, planting vegetables and fruit in your garden is a great way to save money and go organic. Having nice neighbours might not directly add value to your property, but they can often act as a deal breaker if a buyer is undecided. Similarly, living in a nice area and a good catchment district for the local schools are added bonuses. If the current economic climate has left you unable to move home, don’t despair, there are a number of things you can do to give your home a makeover and increase its value. Decorating is the best way to make any house look like new, but be careful not to go overboard, you don’t want to end up getting into debt in order to make your house look good. It’s the small things that can make a huge difference.